Posh midfdielder Martin Samuelsen shoots at goal. Behind him is the BBC studio that housed live TV host Gary Lineker and his pundits. Photo: David Lowndes. Peterborough United manager Graham Westley has predicted great things for his young squad after their cruel FA Cup exit to West Brom at the ABAX Stadium tonight (February 10). 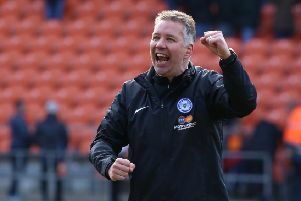 Posh were beaten 4-3 on penalties after getting to within 20 minutes of a fifth round place for the first time in 30 years. Rival managers Graham Westley of Posh (left) and Tony Pulis before the fourth round FA Cup replay. Photo: Joe Dent/theposh.com. It finished 1-1 after 90 minutes and extra time. Jon Taylor fired Posh in front 10 minutes into the second-half, but Darren Fletcher equalised for the Premier League side with a terrific strike. Man-of-the-match Martin Samuelsen and Lee Angol saw their spot-kicks saved by Baggies’ keeper Ben Foster. Westley said: “We showed what quality players we have at this club. It’s a very young squad, but if they keep progressing as they are they won’t be in League One for long. “On the evidence of tonight, many of them could well pull on a Premier League shirt and grace a Premier League ground. Posh players Michael Bostwick (left), Shaquile Coulthirst (centre) and Gaby Zakuani (right) are closely marked at a home corner against West Brom. Photo: David Lowndes. “The desire we showed affected how West Brom played. We defended our goal with great commitment and we showed good thrust going forward. “Over the 210 minutes of the entire tie we were probably the better team. We saw in the first game that we troubled them when we went wide and that happened again tonight. “It was a cruel way to go out and no-one should be too down on Lee and Martin who showed great courage to go up and take a penalty. Darren Fletcher showed with his penalty miss that experienced players can crack under pressure. “Samuelsen is a fantastic talent destined for a great career. He showed how good he is tonight. He can hang on to the ball too long, but that will come with experience. “Missing our chances and delaying some of our shooting opportunities cost us tonightv as did the five-minute lull during which they scored their goal. It was a terrific goal though. “We just have to find a way to make those extra inches count in our favour. In the end greater experience in a penalty shoot out is the reason why we are out of the FA Cup. “We’re disappointed to be out. We wanted to be in the fifth round of the FA Cup, but my lads shouldn’t be disappointed with tonight. We will dwell on the good things and there were many positive pieces of play. “We played with a great energy and a good tempo throughout. “Our crowd were fantastic as well. I an sure they would have left the ground happy with what they saw from their team. Relieved West Brom manager Tony Pulis heaped praise on Posh after the match. Pulis said: “All credit to Peterborough. Their manager, players and supporters were fantastic. The only thing that went wrong for them was the result.